Walking into my freshman year at UT I had mixed emotions about beginning my involvement with a research lab. I had been wanting to conduct scientific research ever since high school and now that I was the allotted the opportunity to be a contributing factor I was extremely excited yet terrified. Not having much lab experience, I was afraid that I would feel inferior and completely lost in this new and challenging setting. Picking DIY Diagnostics and being chosen by the stream was the best choice I could have ever made. The lab mentors were integral to my success in the first semester and made me feel at ease when working through the increasingly complex weekly Skill Developments. To this day our lab mentors have consistently provided us with academic support and given us clarity and direction when overwhelmed with schoolwork and assignments. One of the reasons I chose DIY Diagnostics was because it offered me the ability to learn not only crucial Biology and Chemistry Lab skills but also the opportunity to venture into new scientific and mathematical fields like Computer Science. Although sometimes I wanted to throw my computer at a wall, learning preliminary coding skills was both a challenging and extremely rewarding experience. Being able to learn a new skill set and working towards improvement continues to be gratifying and keeps me wanting to learn more. Being a part of the DIY Diagnostics community has opened my eyes to the potential of interdisciplinary research ventures. Not only has this stream made me feel more confident in my ability to learn and conduct research but also to interact with the scientific community with less fear and intimidation. My current goal in DIY Diagnostics is to create a biosensor that functions as a quick diagnostic for detecting levels of the parasite Cryptosporidium in water sources. Our goal is to create a diagnostic that can be utilized in a variety of situations, for example an avid hiker wondering if it is safe to drink water from a nearby stream or a traveler going abroad looking to determine if it is safe to swim in a natural body of water. This diagnostic would function for both consumption and recreational usage. My interest in water testing came from my experiences travelling abroad as well as my involvement with DIY Diagnostics. 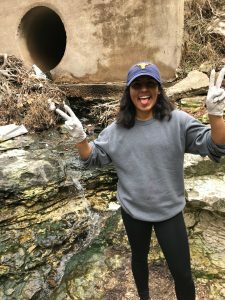 Last semester my fellow cohort members and I conducted extensive studies on a variety of bacterial counts found in the different locations of Waller Creek, which happens to run through the campus of UT Austin. It was but only a week ago when I experienced another one of many “AHA” moments in the DIY Diagnostics stream as I caught myself in a moment of concern regarding my current research project. As I was doing preliminary research for my project and realizing the extremely complex characteristics of Cryptosporidium, I heard Tim’s voice from his office say “Remember we’re only trying to diagnose! We aren’t trying to cure the disease.” Often times there is a great pressure put on our generation to solve a large part of the world’s problems spanning from complex environmental issues to maladies galore. Tim’s words helped ease my worries, reminding me that the purpose of our lab is to produce reliable diagnostics for current world issues as the first step in identifying their presence and the dangers they pose to humans. The first step to recovery and a solution to such issues is a reliable diagnostic and I am so incredibly proud and excited about where the efforts of our lab cohort will take us this year.